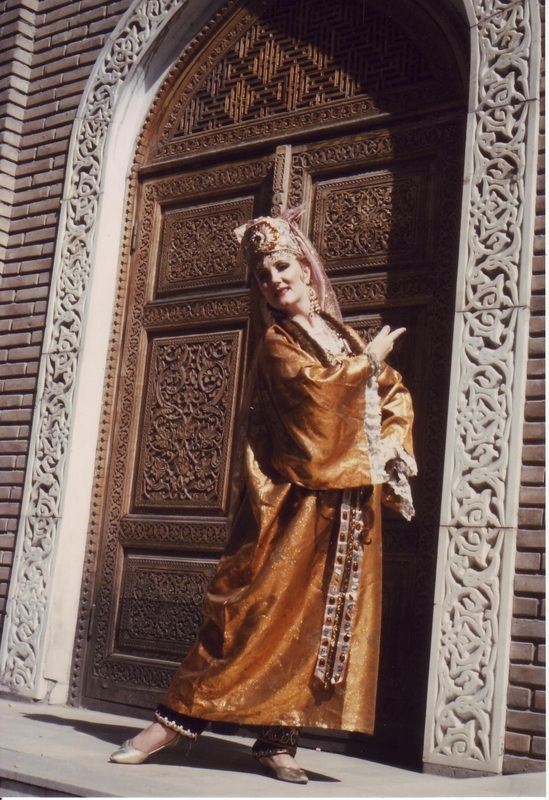 "Splendors of the Silk Road"
Please note, these costumes are not for sale. Photographs have been posted for educational purposes. Oasis Dance Camp in Traverse City, Michigan; and the annual conference of the Assembly of Turkish American Associations. 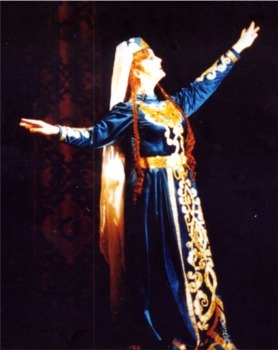 soloist with Ensemble formerly based in Uzbekistan. 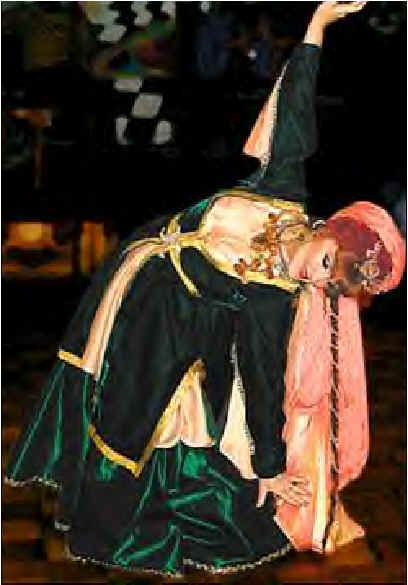 Gift of Honored Artist of Uzbekistan Viktoria "Violat" Akilova. Sewn form fabric purchased by Laurel Victoria Gray in Tajikistan. Sewn by Laurel Victoria Gray from re-purposed vintage taffeta, velvet, and silk. Jewelry pieces have been sewn onto the dress, creating something of a portable bank account. In times of need, the silver jewelry could be removed and sold. Laurel Victoria Gray acquired the headdress jewelry in the 1980s and the garments in the early 1990s. presented it to Laurel Victoria Gray. The sparkling crown was also a gift to Dr. 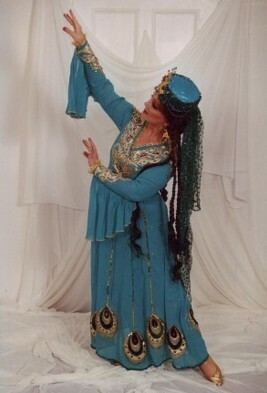 This Azerbaijani dance costume was custom made according to traditional styles for Laurel Victoria Gray by Zinaida Kuraish of State Academic Bolshoi Theater of Opera and Ballet named for Alisher Navoi in Tashkent,Uzbekistan. The blouse is lace and the jacket is patterned with shades of bronze, black, and gold. The bronze satin skirt is very full. The white silk veil is embellished with hundreds of single sequins sewn in patterns by hand by LVG. C oming soon -- more costumes from the collection!